Energy in Azerbaijan describes energy and electricity production, consumption and export in Azerbaijan. Kazakhstan’s oil production is projected to decrease by 20, 000 barrels per day in 2015 to average 1.62 million barrels per day, OPEC says in its October oil market report. In its September oil market report, OPEC predicted that Kazakhstan’s oil production will decrease by 10, 000 barrels per day in 2015. OPEC said that Kazakhstan’s August output declined compared to July by a steep 86, 000 barrels per day to 1.51 million barrels per day, the lowest level since October 2014. This was due to a 0.1 million barrel per day decline in Tengiz field output. Preliminary supply data for third quarter of 2015 indicates a decline by 50, 000 barrels to 1.55 million barrels per day. Lower investment in mature onshore fields such as Uzen and Emba is weighing on the country’s operations. Indeed, evidence suggests some smaller Kazakh producers have already shut in wells due to poor economics. Moreover OPEC revised a forecast for Kazakhstan’s oil production for 2016. In its October oil market report, OPEC forecasted that oil production in Kazakhstan will decline by 30, 000 barrels per day to average 1.57 million barrels per day in 2016, an upward revision of 10, 000 barrels per day from the previous month’s forecast. The report also noted that different sources have said that Kazakhstan’s giant Kashagan project was unlikely to start production before mid-2017. Kazakhstan produces oil mainly from its largest oil fields - Karachaganak and Tengiz. Karachaganak field is one of the world's largest fields. Its oil and condensate reserves stand at 1.2 billion tons, and gas reserves exceed 1.35 trillion cubic meters. As of today, almost 45 percent of gas and 16 percent of all liquid hydrocarbons produced in Kazakhstan are being extracted from this field. The Tengiz field in the west of Kazakhstan is one of the deepest and largest oil fields in the world. 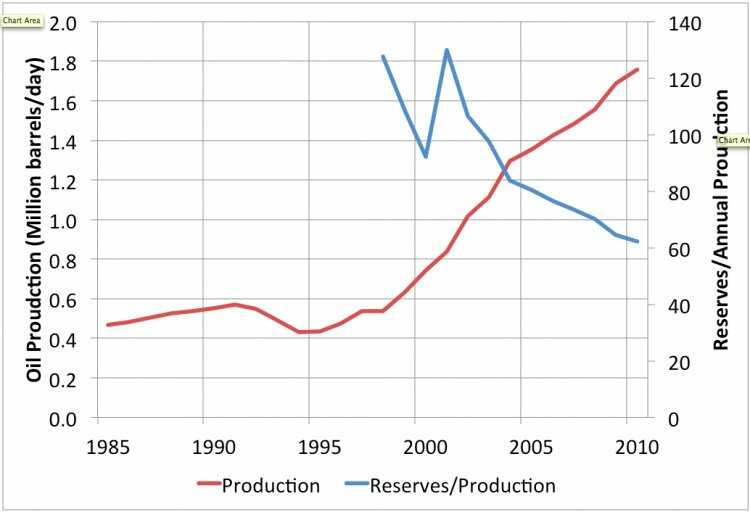 Total estimated reserves amount to three billion tons (26 billion barrels). Another large Kazakh oil and gas field is Kashagan located in the north of the Caspian Sea. Oil production at Kashagan started in September 2013, but its operation was suspended after a gas leak appeared from the ground pipeline stretching from the Island D to the Bolashak plant. The government expects to resume oil production at Kashagan in late 2016. What is the news on oil prices. Crude was around $60/bbl this week, a 6-month high, but analysts are bearish, & cut their forecast for 2010 by about 11%.